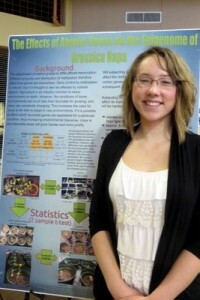 The Missouri Tri-county Science Fair hit a run of bad weather when it was scheduled on February 21. Rescheduling forced the fair to split: the Honors division for grades 9–12 was held on March 7 at Francis Howell North HS. The K–4th, 5th–8th, and non-Honors 9th-12th divisions will be held on April 25th, 8am–12noon, at Saint Charles Community College Student Center. Co-coordinator, Philip Ferko, pferko8@gmail.com, 678.592.4710 (cell), is still soliciting volunteers for April 25. But for now, we can officially congratulate the Honors winners (and, in fact, indirectly all the participants): congratulations! 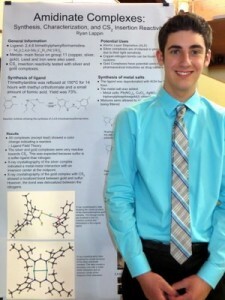 First place went to Ryan Lappin, Grade 12, Timberland High School, Wentzville, MO for his Amidinate Complexes: Synthesis, Characterization, and CS2 Insertion Reactivity. 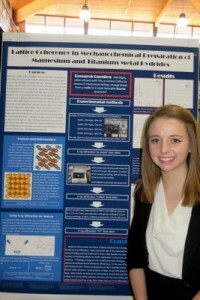 Katherine Balfany took second place with Lattice Coherency in Mechano-chemical Preparation of Magnesium and Titanium Metal Hydrides. She is in Grade 12 at Holt High School, Wentzville, MO. Another Holt High School student, Amelia Stone, finished with a third-place medal for her project, The Effects of Abiotic Stress on the Epigenome of Brassica Rapa.